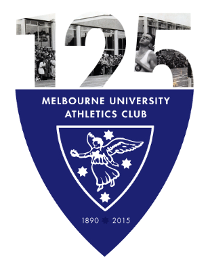 High quality athletics was on show at Olympic Park on Thursday, 26th of November with the first Victorian Milers Club meet of the season, including the Victorian Open 5000m Championships, being run. MUAC athletes toed the line and showed some good pre Christmas form. Madeleine Oldfield ran a big personal best in the Women’s 5000m Championship race to run under 18 minutes for the first time, to come 8th. 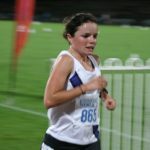 Charlotte Curnow (who runs for MUAC in winter and Deakin in summer) ran well to finish 6th in 17:27. 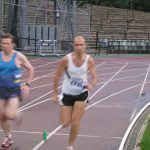 Hamish Beaumont battled valiantly in the Men’s Championship 5000m race to avoid being ‘doubled’ by the lead runners, succumbing with a lap to go. There was some impressive 800m racing with Jordan Mayston running 2:00.02, a season’s best that would last for two days! Michael Wong came from the clouds to run 2:05, while David Ulbrick ran a solid 2:02. MUAC stalwarts Tim Thomas and Tony Brain were racing, keen to get some racing in at Olympic Park before athletics moves.